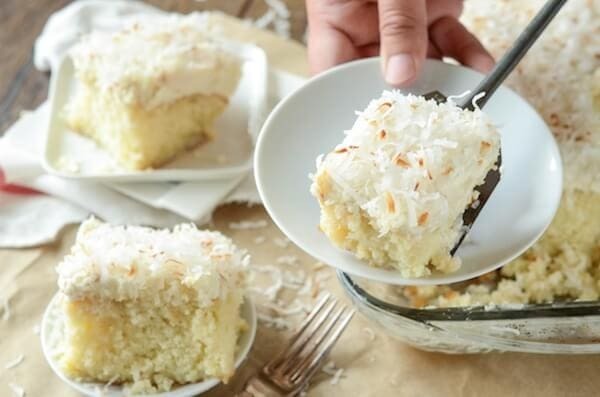 This Coconut Tres Leches Cake has been a favorite family recipe for so many years. My Mom started making this when I was in elementary school and I can still remember sneaking into the fridge before bed and stealing one last bite. It’s seriously so dang good and very, very easy to make. You start with a boxed white cake mix. That’s right, this is an easy one to make! Bake it according to the package directions in a 9×13 dish. Then we can fancy it up! While it’s still piping hot, stab the cake with a fork, or a chop stick, and make a ton of holes. Then slowly pour on a whole can of cream of coconut (like Coco Lopez — not coconut milk!!) and a can of sweetened condensed milk. It will take about 10 minutes for the cake to soak up all of the liquid, but I promise it will. 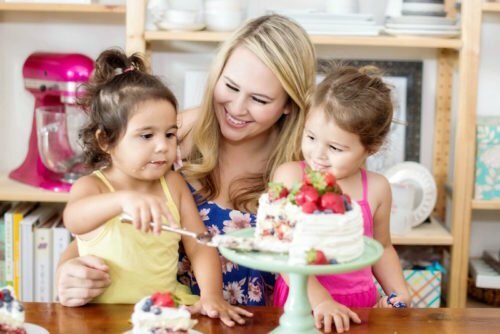 As you can see, Lyla was adorably excited about the whole process of topping the cake! She helped from start to finish and then as soon as I turned my back she had stolen a bite. She’s totally my mini me. After the liquid soaks in and the cake is chilled, you spread on a nice thick layer of homemade coconut whipped cream. It only takes a couple of minutes to whip up in your stand mixer and is so worth the effort. 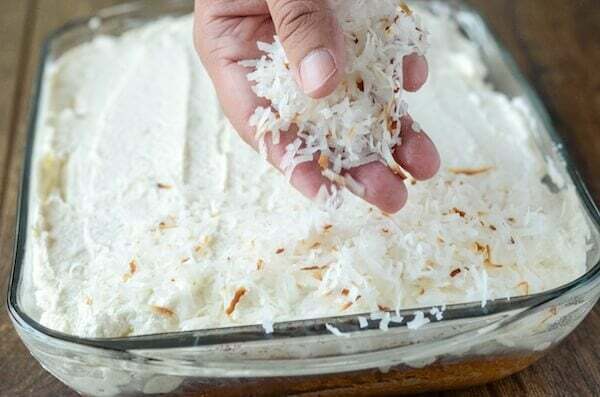 Lastly, you top it with some toasted shredded coconut and chill it in the fridge until you are ready to serve it! I brought this Coconut Tres Leches Cake to a 4th of July party and it was a massive hit. Everyone was asking for the recipe and were shocked when I told them it came from a boxed cake mix. 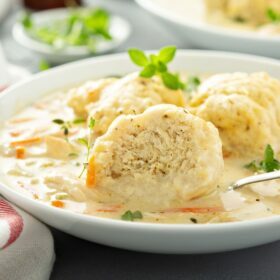 Gotta love easy recipes that have great flavors and are still impressive! 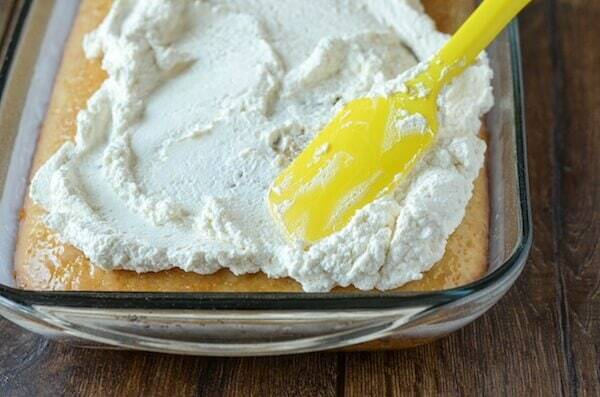 I have never made tres leches cake, but I love to eat it! I need to add your recipe to my vault ASAP! Oh my gosh – now this is a cake for me!! Love coconut! 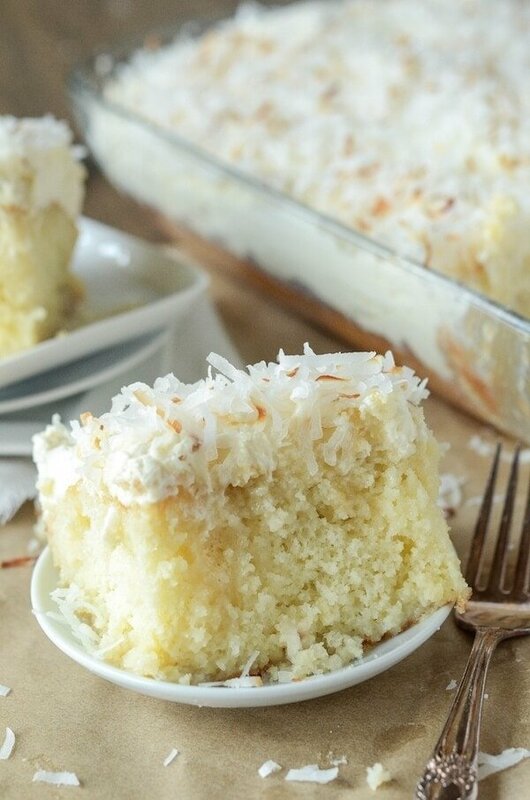 I still have never made tres leches cake, this looks great with the coconut! 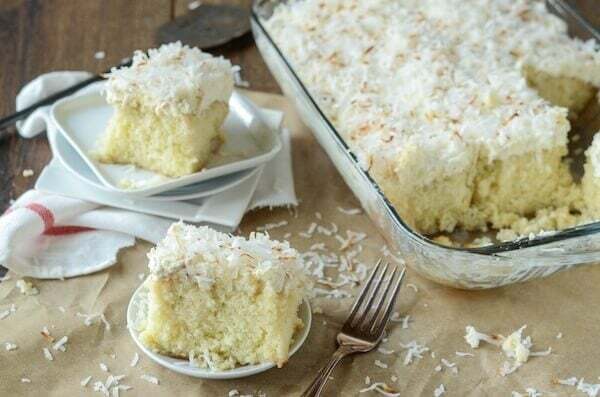 Coconut cake sounds so yummy right now. Maybe I should go make some lunch! Thank you for this recipe. But you did mot tell us how to make THE COCONUT WHIPPED CREAM. I would appreciate if you send it or post it. how do you toast the coconut? Never Mind! I see that was already asked! Just add a little coconut extract to your whipped cream! The full recipe for the whipped cream part is at the bottom of the recipe. Just add a little coconut extract to your whipped cream! Hi NONEYA DAMNBUSINESS, what a whitty name. You’re right, it has heavy whipping cream, a can of cream of coconut and a can of sweetened condensed milk. But sure, it only has one milk product in it. Have a nice night! Great recipe can’t wait to try it! People DO love to criticize. Three milks if you count the heavy cream, 2- condensed milk, 3-cream of coconut is made with coconut milk. I see only two milks to pour over the cake, and the heavy whipping cream is for the topping, is this correct? 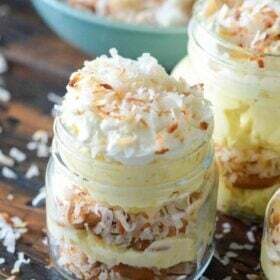 I’m in love with anything coconut so I’m going to make it and love it! Can I call it ” dos leches coconut cake with uno mas leches on top” I think it sounds catchy! I’m so not Latino so I apologize about my Spanish. Thanks for this recipe Jessica! People, stop being overly critical it’s a cake! In my opinion, I believe the whipping creme would be considered the third leche. Yes! It should work! However, I don’t think you can stack this one on a cake stand. It’s filled with liquid. The cake looks yellow instead of white. Is it white cake mix that is used & not yellow? 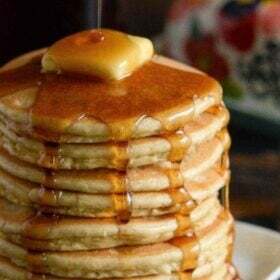 I plan to make this soon. Thanks for sharing and thanks for your patience & gracious responses. Tres leches is my husband’s favorite cake! And I love everything with coconut! I found your recipe and it looked so easy to make so I made it! it came out delicious! My husband loved it and so did I! Thank you for the recipe! OMG…this cake is AMAZING!!! I made it for the first time for our neighborhood 4th of July block party. Once the word got out how delicious it was, it was the first dessert that was gone. I actually saw a few people have two pieces of it. And, I can’t tell you how many people told me how delicious it was. 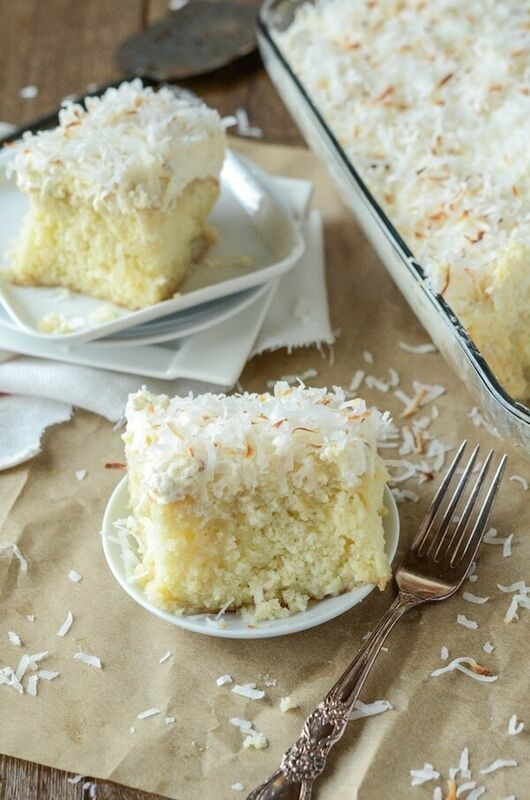 My husband loves coconut and I think he may have told me 20 times how good it was and that it was one of the best cakes I ever made. I will definitely be making this cake on a regular basis. Thank you!!! Bonjour j’aimerais revoir cette recette de gateau avec le lait de coco et recouvert de coconut en FRANÇAIS ….. MERCI !!! I put coconut rum in my whip cream for the flavoring. I amnot a big fan of coconut flavoring taste like soap to me. Or you can put the cream de coco in with the whipping cream also. 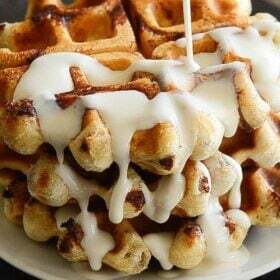 To make the whipped cream on top. Can you follow this recipe but make them into cupcakes? I’d like to do it for a bit gray party. They will be very messy, I wouldn’t recommend it since you pour liquid on top of the cake. It would make the liners fall off and be a bit of a mess! 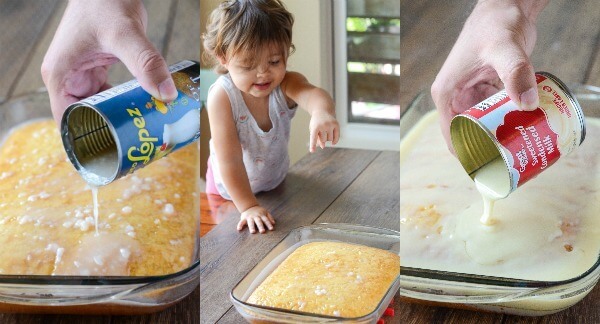 Someone on pinterest has taken credit for your Tres Leches Cake. When you click to view the recipe it takes you to a wall mart gift card sign up. Wonderfully moist cake and easy to make. The recipe didn’t mention how to toast the coconut. I spread it on a cookie sheet and popped in the oven @ 325 for 6 minutes. Made this for my adult son’s birthday. It was a big hit. Made this for a church life group I’m in, and it was DEVOURED! This was so simple and easy and delicious! Hi. 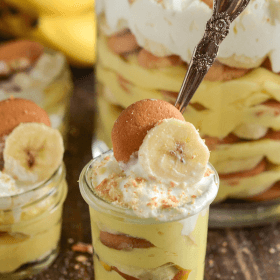 I want to make this for my husband’s birthday today but I can not find the recipe for the coconut whipped cream! Please help! Someone else asked this and was told to read the directions carefully. I have quadruple checked and no where does it say how to make it. 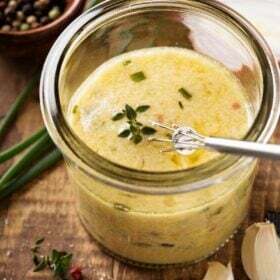 On the Link to click on it just takes me to a page with a bunch of recipes to search through. Please help! Can this recipe be adapted into cupcake form? Any help would be really appreciated !